From time to time in this book, we have alluded to the modern trend away from slides with bullet points and toward presentations that include more graphics. Successful presenters have learned that most people can’t listen to a presentation while they are reading slides. So these presenters make sure most of their slides display graphics that represent the point they are making, giving the audience something to look at while they focus on what is being said. 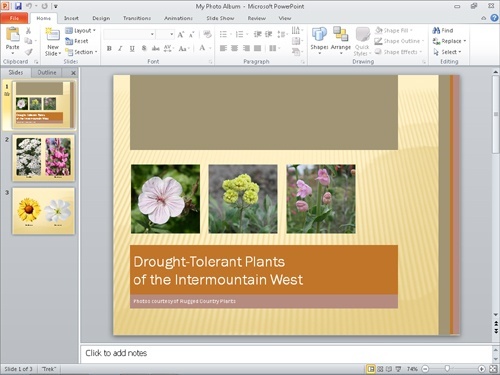 PowerPoint 2010 gives you the tools you need to create graphic-intensive rather than text-intensive presentations. When you want to display a dynamic array of pictures in a presentation, you can use a photo album template to do the initial layout and then customize the album by adding frames of different shapes, as well as captions. To integrate the slide layouts from a photo album template into a more traditional presentation, create the photo album and then import its slides into the other presentation by clicking Reuse Slides at the bottom of the New Slide gallery. Remove the background by clicking the Remove Background button and then designating either the areas you want to keep or those you want to remove. Sharpen or soften the picture, or change its brightness or contrast, by choosing the effect you want from the Corrections gallery. 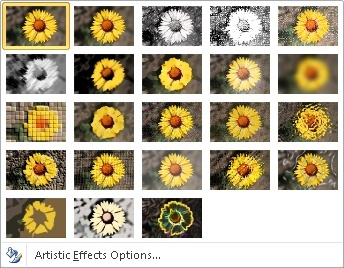 Enhance the picture’s color by making a selection from the Color gallery. Make one of the picture’s colors transparent by clicking Set Transparent Color at the bottom of the gallery and then selecting the color. Choose an effect, such as Pencil Sketch or Paint Strokes, from the Artistic Effects gallery. Apply effects such as shadows, reflections, and borders, or apply combinations of these effects by choosing a predefined style from the Picture Styles gallery. Add a border consisting of one or more solid or dashed lines of whatever width and color you choose. Rotate the picture to any angle, either by dragging the green rotating handle or by clicking the Rotate button and then choosing a rotating or flipping option. Minimize the presentation’s file size by clicking the Compress Pictures button and then choosing where or how the presentation will be viewed—for example, on the Web or printed—to determine the optimum resolution. You can also delete cropped areas of a picture to reduce file size. In this exercise, you’ll create a photo album displaying pictures of native plants. You’ll crop, resize, remove the background, apply an artistic effect, and add captions. You’ll also reuse a slide from another photo album, and apply a theme. On the Insert tab, in the Images group, click the Photo Album button. The Photo Album dialog box opens. Under Insert picture from, click File/Disk. The Insert New Pictures dialog box opens. Navigate to your Chapter08 practice file folder, click NativePlant1, hold down the Ctrl key, and click NativePlant3 through NativePlant5. Then click Insert. The Photo Album dialog box now has four graphics files listed in the Pictures In Album list. You can click each picture in turn to view it in the Preview box. 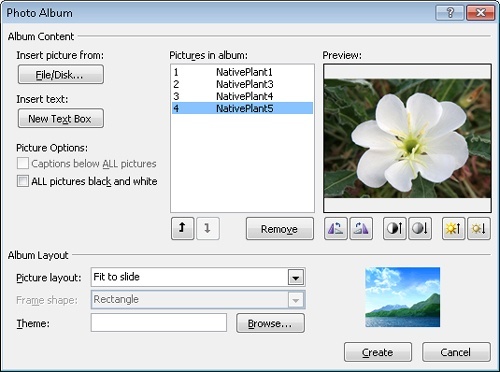 In the Pictures in album list, click NativePlant4, and then click the Move Up button to make it the second picture in the list. Preview the pictures in turn, and then click the Contrast and Brightness buttons as necessary to give the four photographs a more even tone. You could also adjust the rotation of a picture, but in this case, that is not necessary. In the Album Layout area, display the Picture layout list, and click 2 pictures. Display the Frame shape list, click Rounded Rectangle. Then click Create. PowerPoint creates a presentation called Photo Album that contains a title slide and two slides each containing two pictures. On the title slide, PowerPoint inserts the user name stored in the PowerPoint Options dialog box. The appearance of buttons and groups on the ribbon changes depending on the width of the program window. Save the presentation as My Photo Album. Display Slide 2, and click the photo on the left. Then on the Format contextual tab, in the Size group, click the Crop arrow. In the list, point to Aspect Ratio, and then under Portrait, click 2:3. PowerPoint crops away parts of the picture, leaving a centered "window" over the photo, sized to the proportions you specified. Cropping handles surround the active area so that if you want, you can adjust the cropped areas. Click the photo on the right, and then repeat the cropping process in step 9. In turn, select each photo, and drag the upper-left and bottom-right corner handles until the photos occupy the majority of the space on the slide. When sizing the photo on the right, release the mouse button when the dotted guide appears, letting you know that the photo is aligned with the photo on the left. Display slide 3, and crop the photo on the left to Square, 1:1. 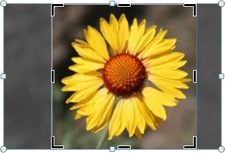 Then point inside the crop window, and drag to the left until the cropping window is centered on the flower. PowerPoint maintains the size of the crop window but moves the photo under the window to the left. The image of the flower is centered in the crop window. Click the photo on the right, and in the Size group, use the down arrow to reduce the height to 3". Then crop the photo to Square, 1:1, adjusting the crop window so that all of the flower is showing. Enlarge and align the photos so that they occupy the entire width of the slide. Click the left photo, and in the Adjust group, click the Remove Background button. The Background Removal contextual tab appears, and PowerPoint marks the areas of the photo that will be removed. 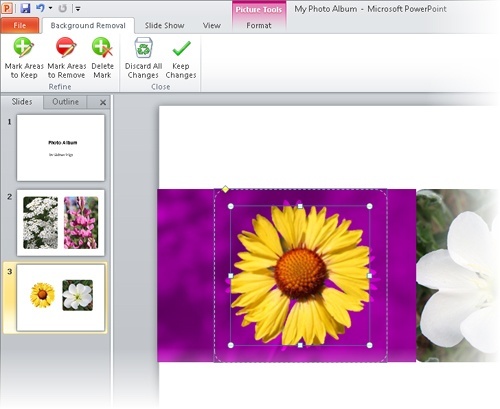 The thumbnail on the Slides tab shows what the flower will look like after its background is removed. Drag the handles on the frame surrounding the flower until the entire flower is visible within the frame. Then in the Close group, click the Keep Changes button. Repeat steps 15 and 16 to remove the background of the photo on the right. Then click a blank area of the slide. 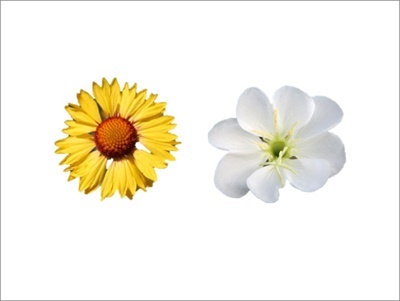 The background is removed from both flower photos. The flowers stand out vividly against the plain slide background. Click the photo on the left, and then on the Format tab, in the Adjust group, click the Artistic Effects button. The Artistic Effects gallery appears. You can choose from a wide variety of effects in this gallery. Point to each thumbnail in turn to see a live preview of the photo with the effect applied. Then click the third thumbnail in the second row (Paint Brush). Repeat steps 18 and 19 for the photo on the right. The two photos now resemble paintings. On the Insert tab, in the Images group, click the Photo Album arrow, and then click Edit Photo Album. The Edit Photo Album dialog box opens. This dialog box is the same as the Photo Album dialog box. With it, you can make changes to an existing photo album. In the dialog box, under Picture Options, select the Captions below ALL pictures check box, and then click Update. Click slide 1, and on the Home tab, in the Slides group, click the New Slide arrow, and at the bottom of the gallery, click Reuse Slides. The Reuse Slides task pane opens. In the Reuse Slides task pane, click Browse, and click Browse File. Then browse to your Chapter08 practice file folder, and double-click the PhotoAlbumTitleSlide presentation. This presentation contains one slide that was based on a slide in the Contemporary Photo Album template available under the Sample Templates on the New page of the Backstage view. 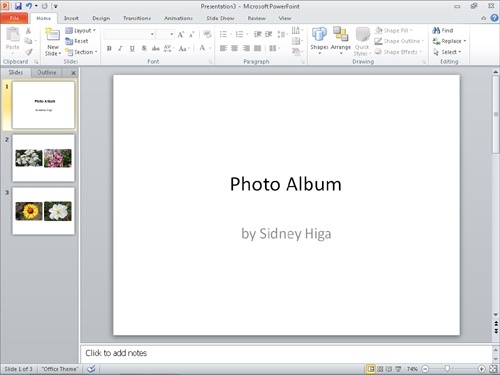 In the Reuse Slides task pane, click Slide 1 to insert it after the title slide of the My Photo Album presentation. Then close the task pane. Delete the blank title slide. Then on the Design tab, in the Themes group, display the Themes gallery, and select a theme that showcases the photos. We chose the Trek theme. Careful theme selection can pull an entire presentation together. Save the My Photo Album presentation, and then close it.